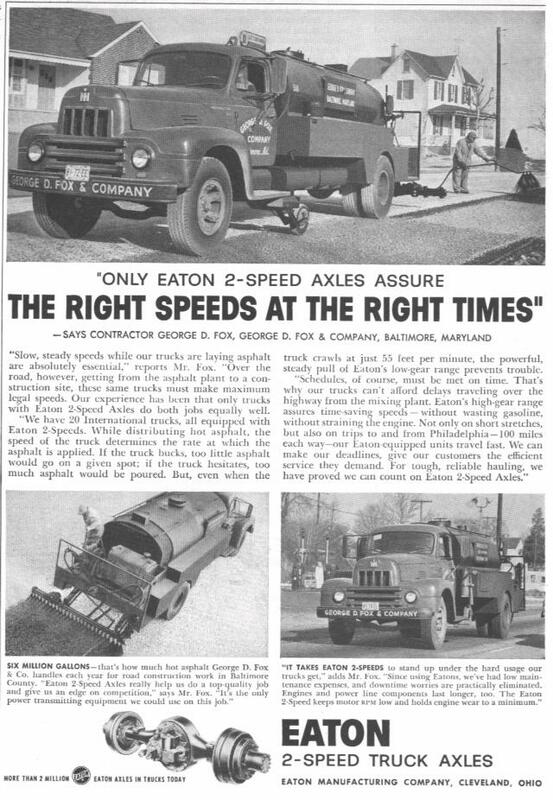 Interests:7130MFD, 1660 Axial, 71 Loadstar, 59 B-110, R160 S160, Cockshutt 40 & 50 "The Merc"
IH trucks sometimes showed up in other ads like this one for the Eaton two speed axle. R190 I am guessing. 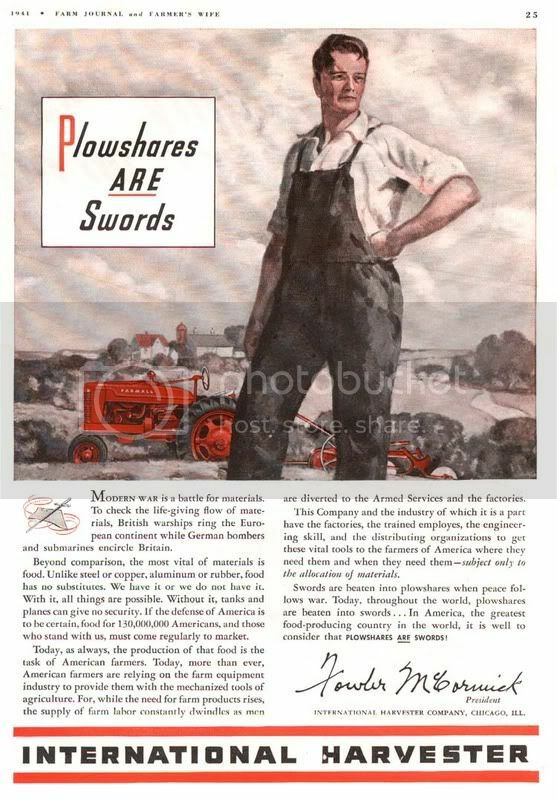 The ad for war bonds features a "big K" IH. 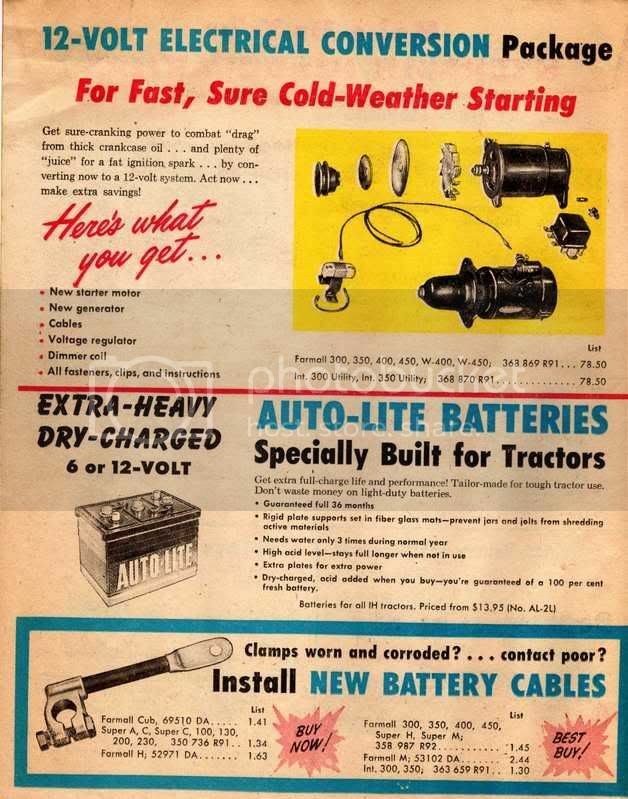 As much as a truely enjoy looking at these old ads from the 50's & 60's, some I well remember, does anyone else think our Kids will look at ads for repair/rebuild parts in another 30-40 yrs and think, "OMG, those prices are rediculous they're so low!!!" 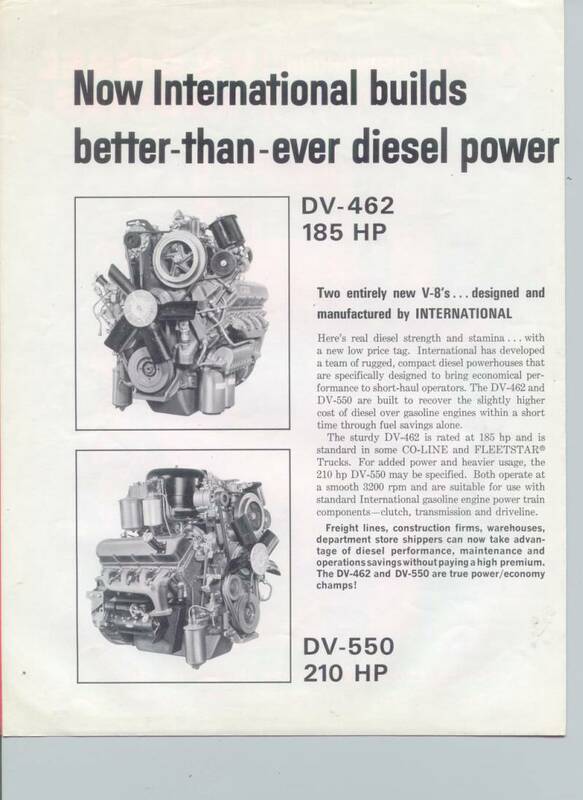 I think it was around 1965 Dad had his '51 M engine rebuilt with 4" M&W Add-Power sleeves & pistons, bearings, gaskets, and all eight new valves. Think the bill came to almost $350 including the labor. 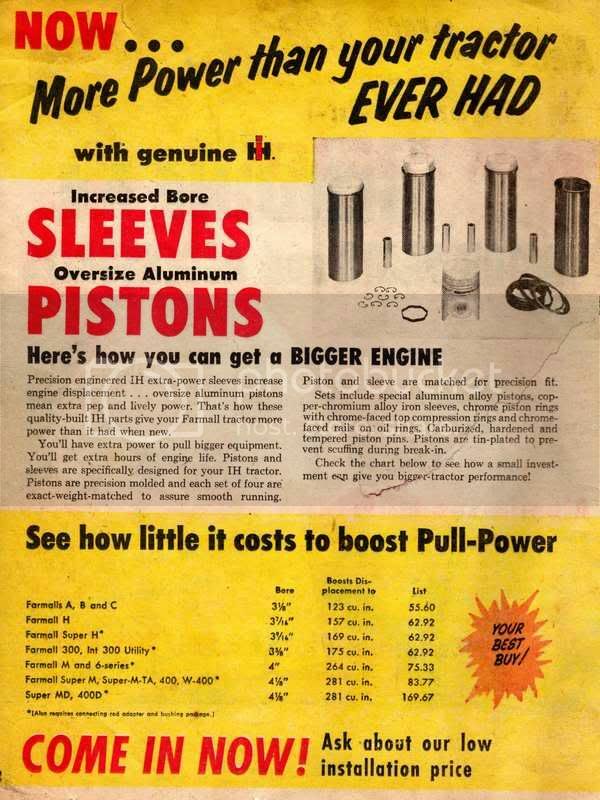 A set of stock Super H/W4 sleeves, pistons, rings for less than $45. 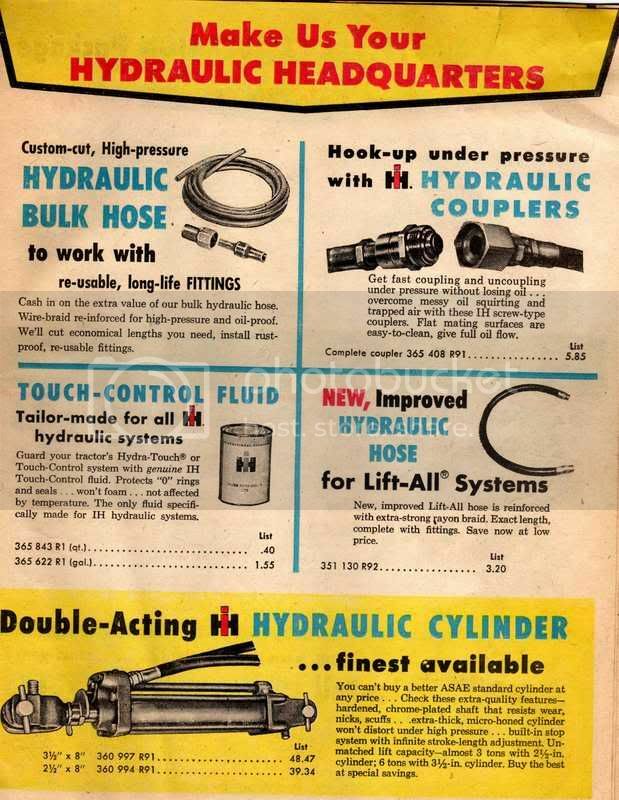 I priced a set to rebuild my Super H 8-10 yrs ago and they were over $800 if I remember right for C/IH parts. 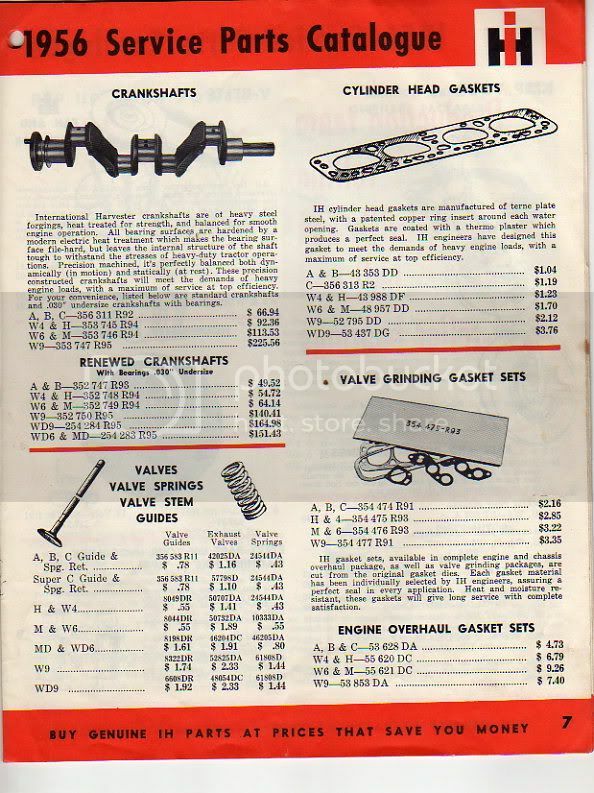 With bearings, gaskets, seals etc parts were over $2000. 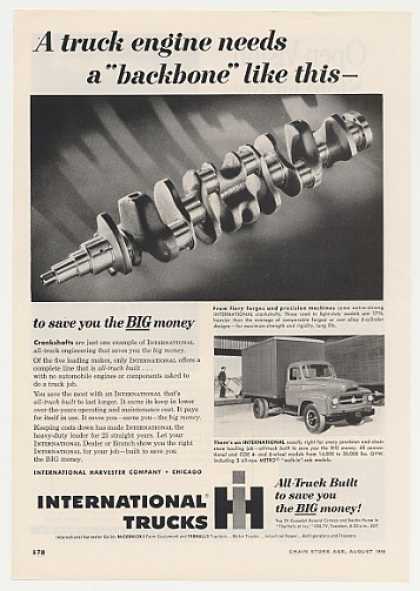 I don't even think C/NH offers engine sleeves/pistons for the letter series anymore. 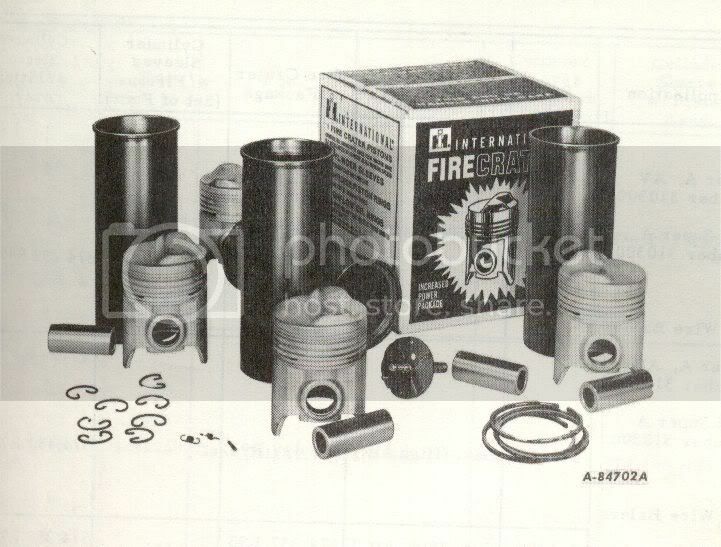 I spent about $45 this summer for a set of ignition points & condensor for the Onan engine in my 982 CC! 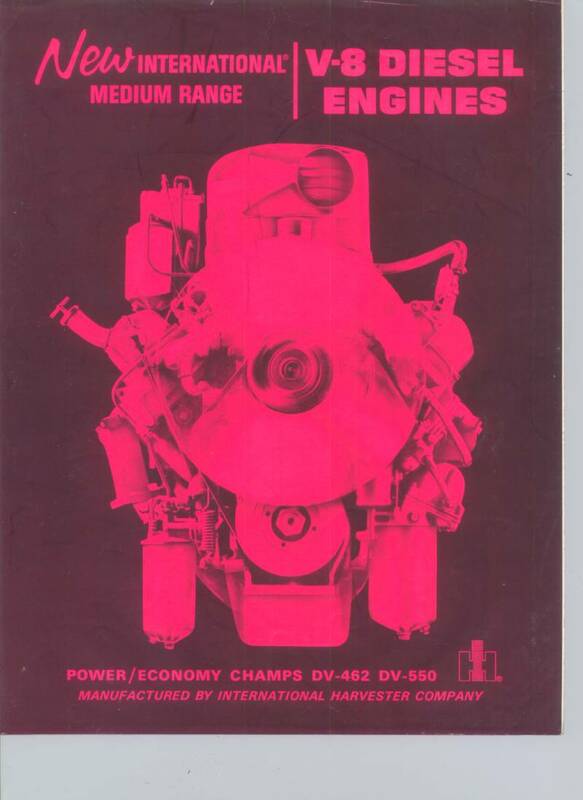 The same parts for the Kohler engine in my other CC were less than $20. 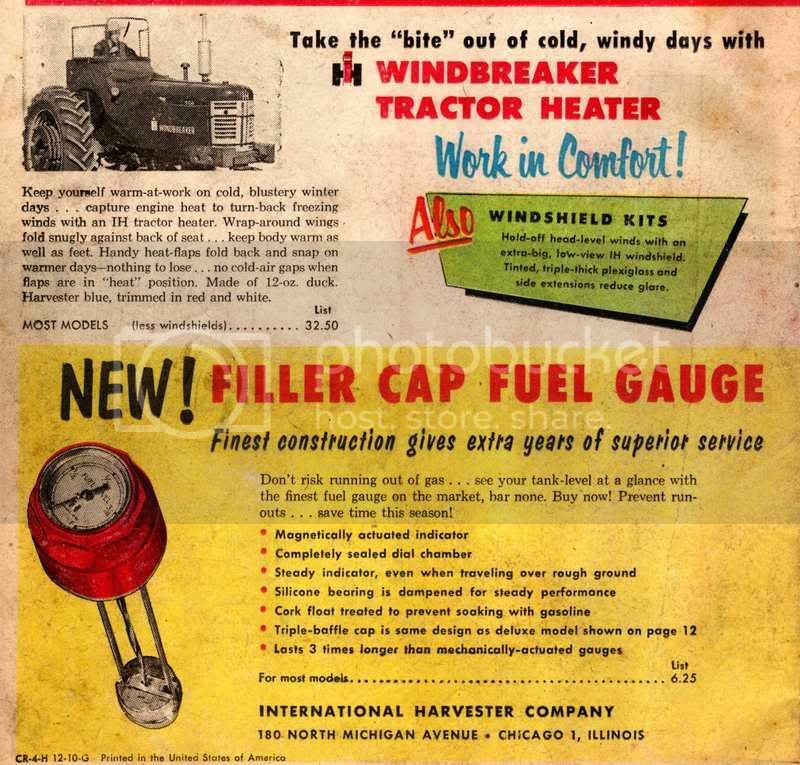 Interests:Family, Anything IHC, Farming, and Turn Wrench for a CAT dealer. 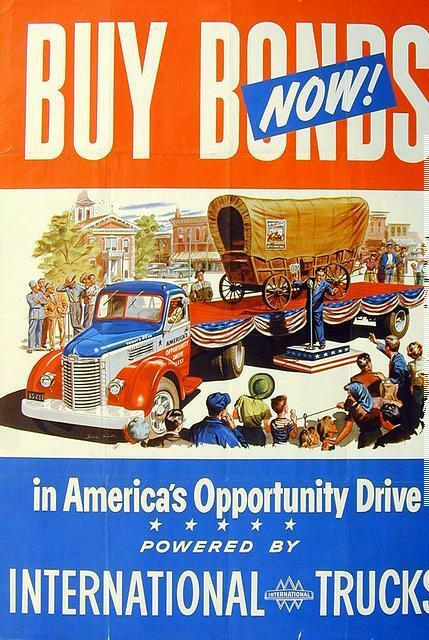 I think they will look in amazment, and the prices. I was wondering if anyone had a idea what one of those TD-25's cost new. 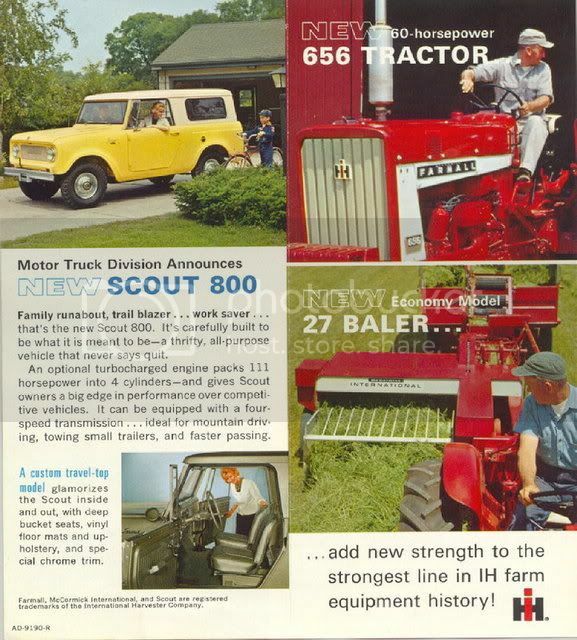 Right know it cost close to $98,000 just to rebuild the engine in a D11R CAT tractor now. 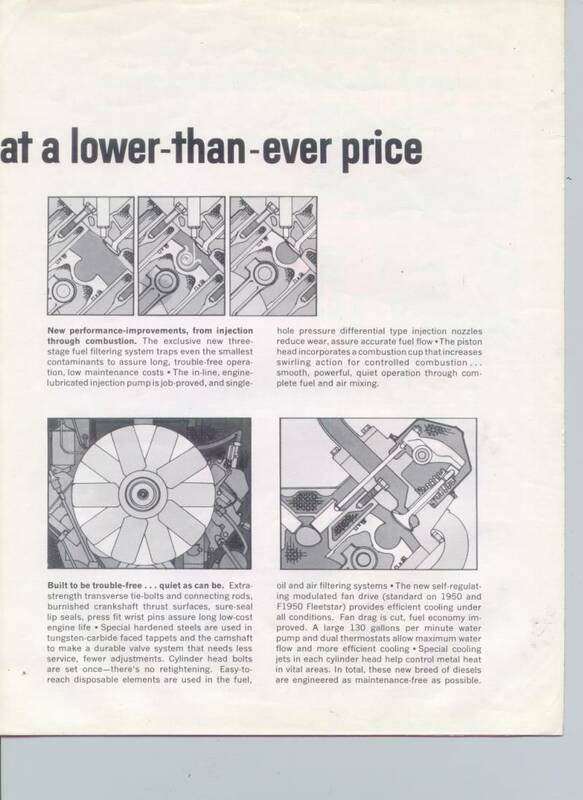 I bet you could have bought the TD-25 for that new back then. 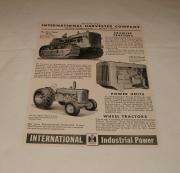 Interests:IH, Steiger, Caterpillar, engines, Big Equipment in general. 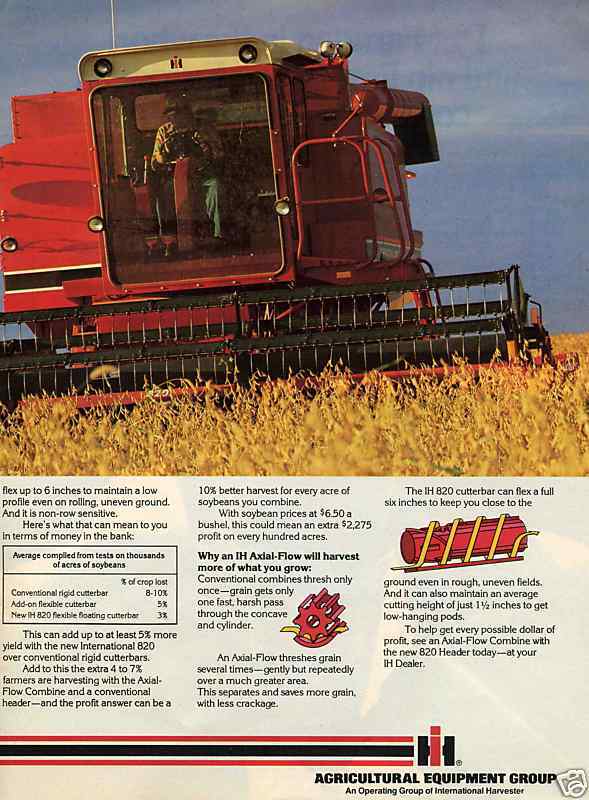 Jason, I believe a mid '70s 25C was right at $150,000. 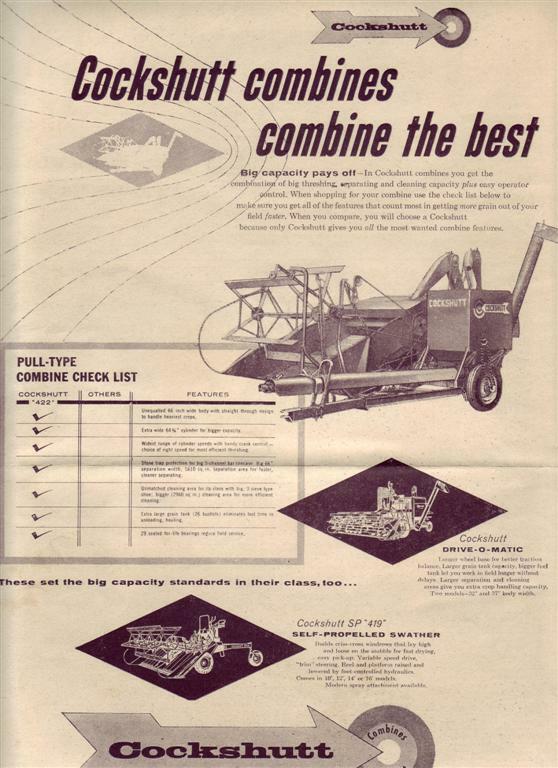 Loadstar, some of these ads are tough to read. I can't seem to get them any better. Yes, the print is a little small to read on some. You could go for a few more kb in size. 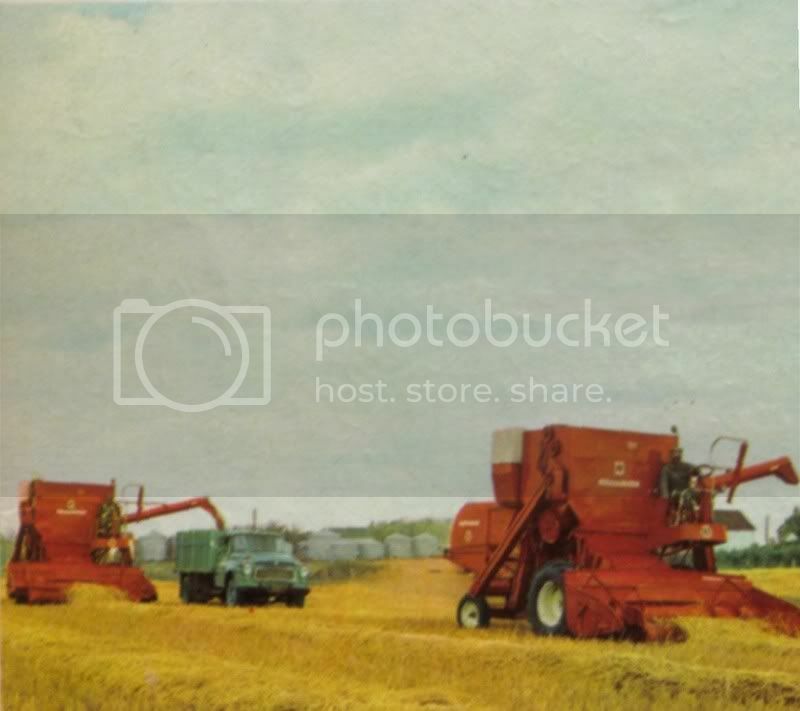 The size limit per post is 512 kb which is usually enough to produce a pretty good image. This one at just under 500 kb is close to the upper limit and produces a good readable image on my screen. 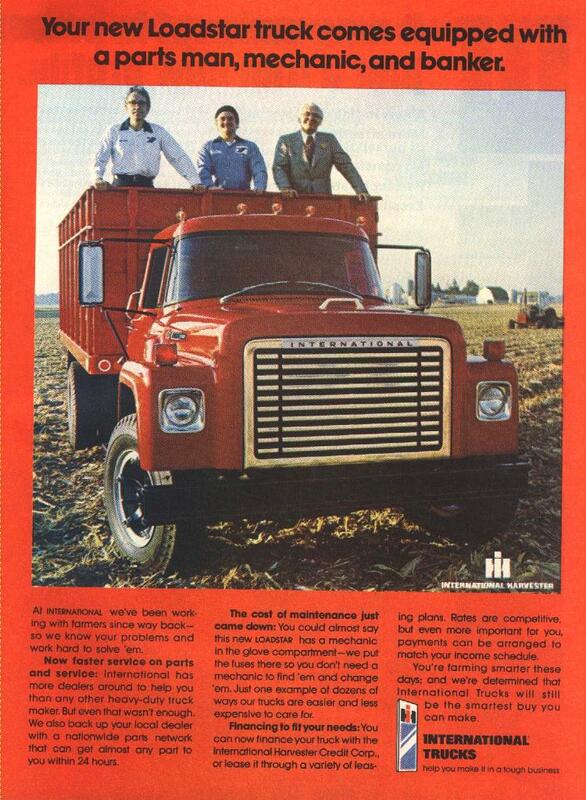 Thats an ad from 1973 Country Guide. I can't seem to adjust the size anymore, they just get worse. Some are ok other i can't even post they turn out so bad. 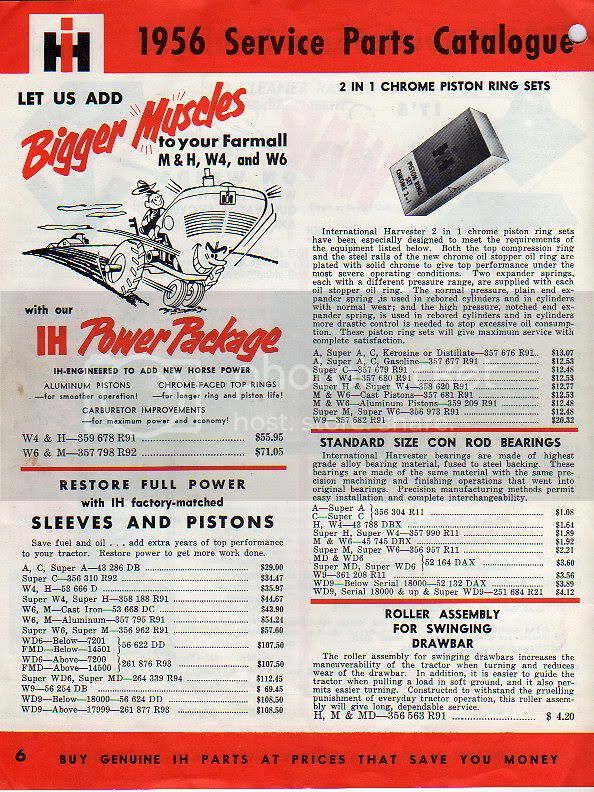 IH sold a lot of these around here. 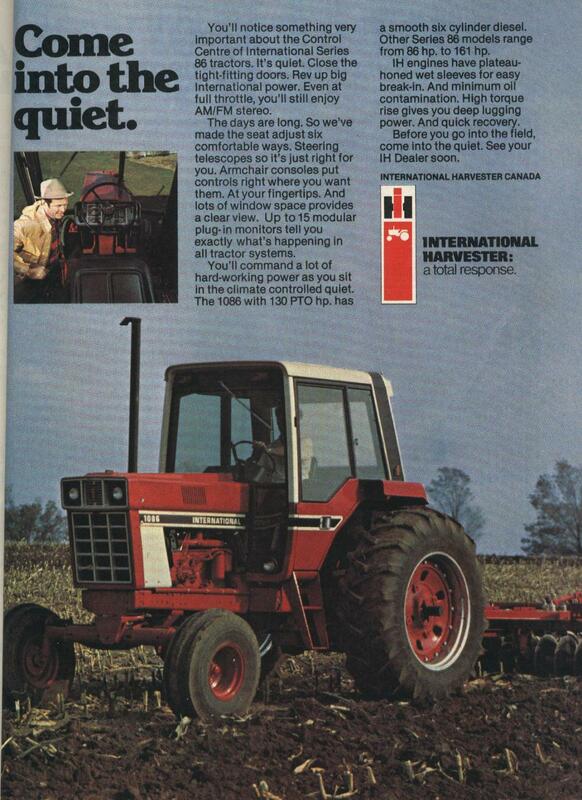 This ad from 1978. 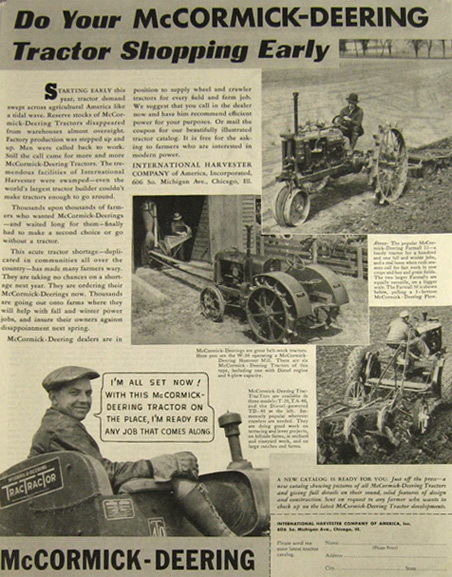 Interests:I enjoy my family, farming, tractors and deer hunting! 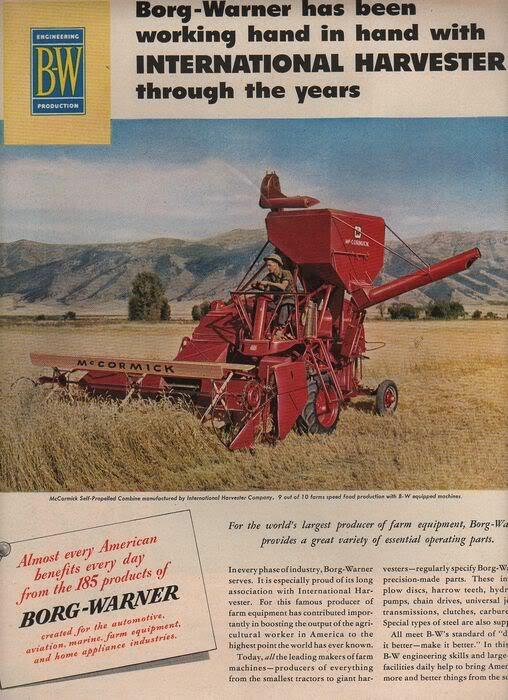 That hay in the baler add has to be the greenest hay I've ever seen being baled! 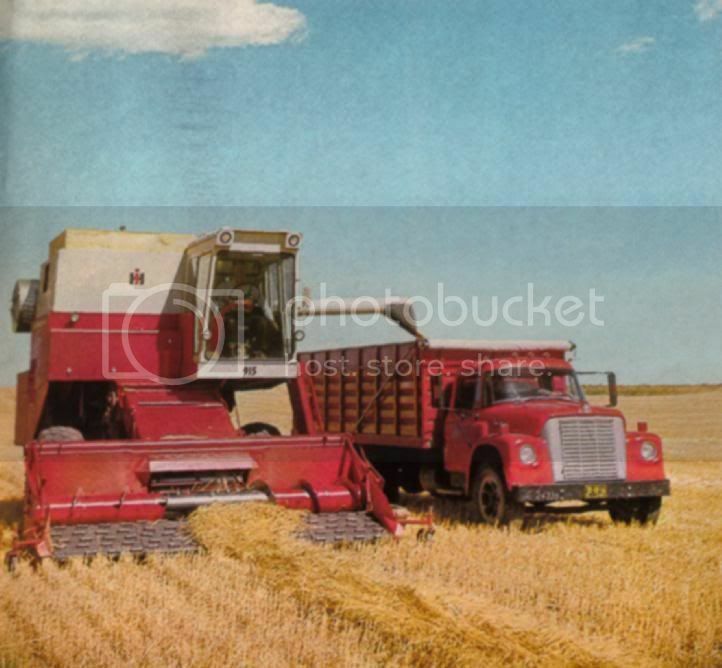 lol And it looks like its being baled into a chopper box! I think sometimes the artists play around with the colours a little to make the sky bluer or the grass greener, or in this case, the hay. 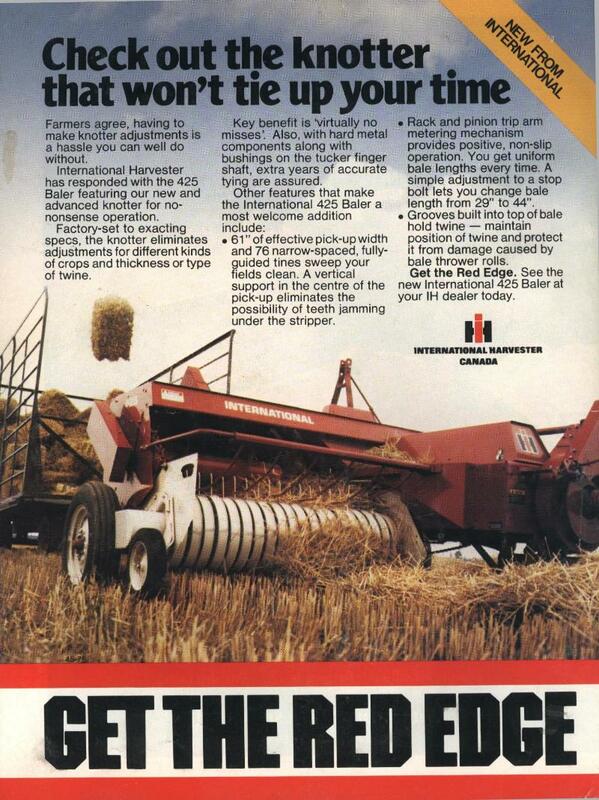 This newer ad shows a model 425 baler baling straw and with a similar bale thrower wagon setup. Its interesting you should bring that forum up. 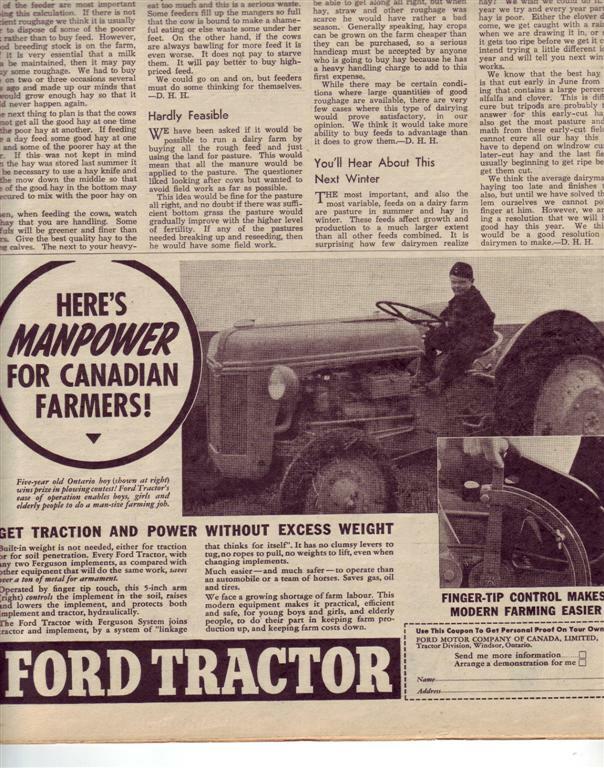 http://www.canadianantiquetractor.com/tractorforum/ I registered there two weeks ago and have not yet been accepted by the moderators. I don't know what is going on . Maybe they have enough members already. Or don't want anybody from outside Ontario? It looks like a very interesting forum with some interesting discussions I'd like to get into but until they activate my account I am shut out. And no way to contact the moderators, i tried that already. 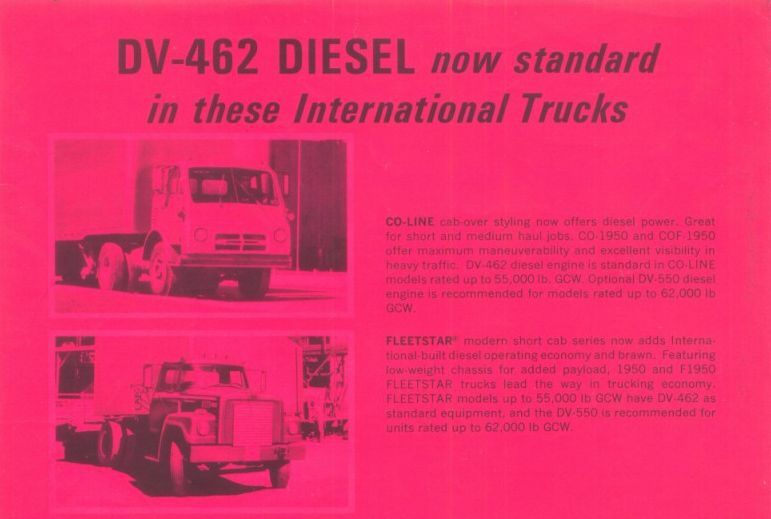 Heres one of the "newer" Loadstar ads from 1974. "That hay in the baler add has to be the greenest hay I've ever seen being baled! 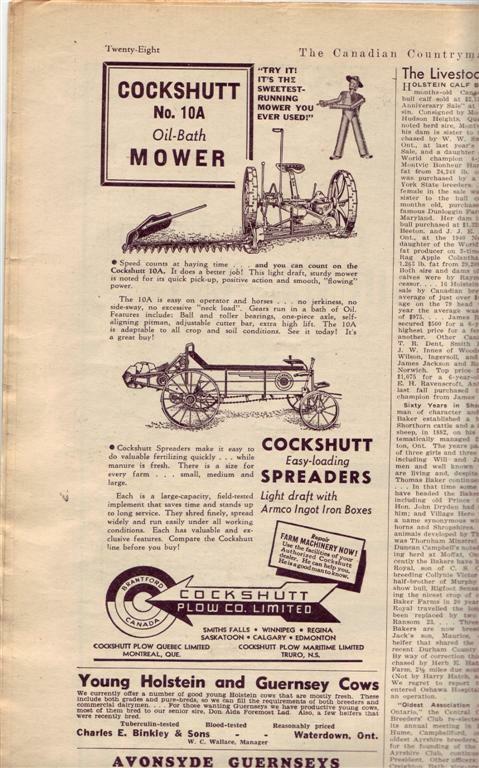 lol And it looks like its being baled into a chopper box!" I remember someone posted a picture of a huge barn fire at Hinsdale Farm, coincidence?? 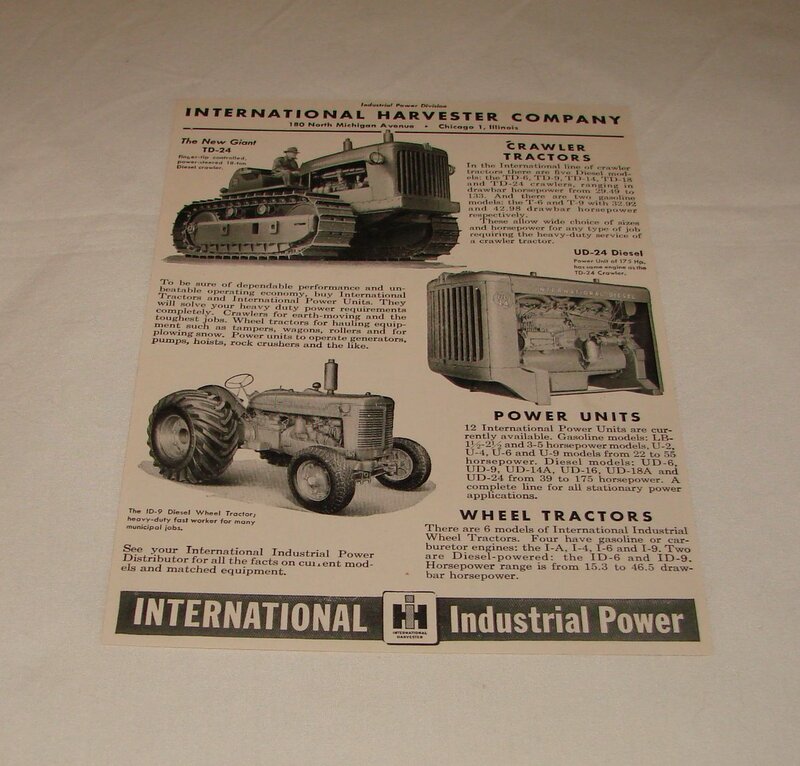 Loadstar: I just tried to register once again to canadian antique tractor but their confirmation code letters baffle me. They are saying i am incorrect but there are some of what appear to be just dots in there and it says I am wrong each time. Is that a way of keeping us out? I use these confirmation codes on other websites and never have troublem with them. Perplexing. I think it took me at least two, maybe three tries to read that security code right . They can be really hard to decipher. Good luck, maybe I'll see you there . 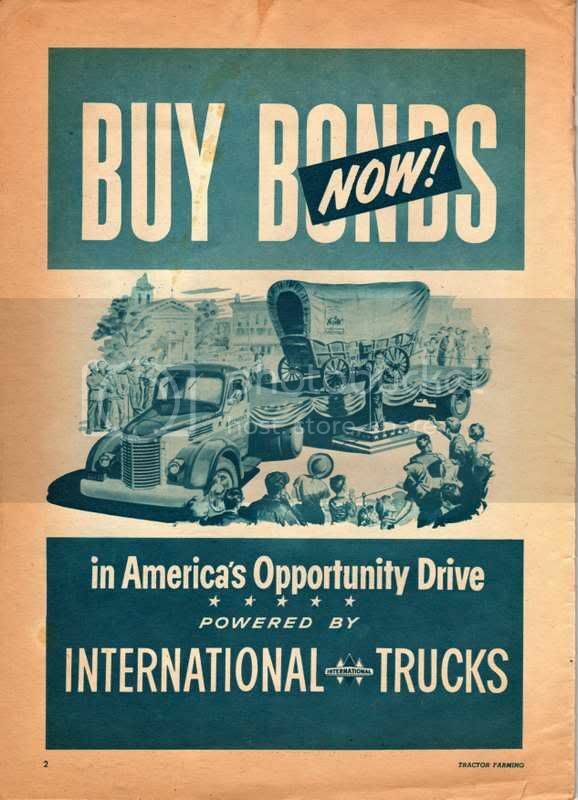 Guess I better post another ad here so we don't get too far off topic. 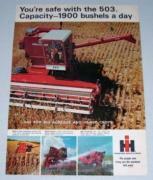 This one I have listed as a 1978 model 914 pull type combine. 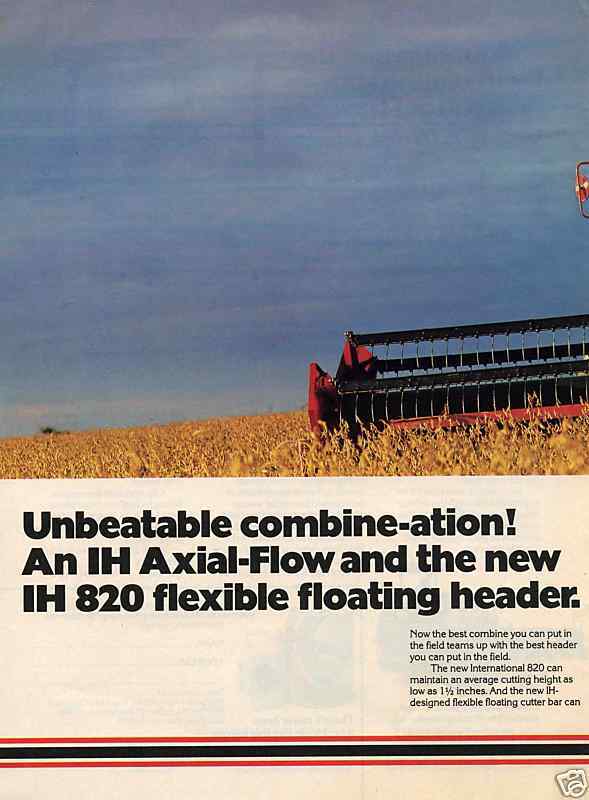 I would think that would be pretty late in the series and IH would soon introduce the rotary combine. 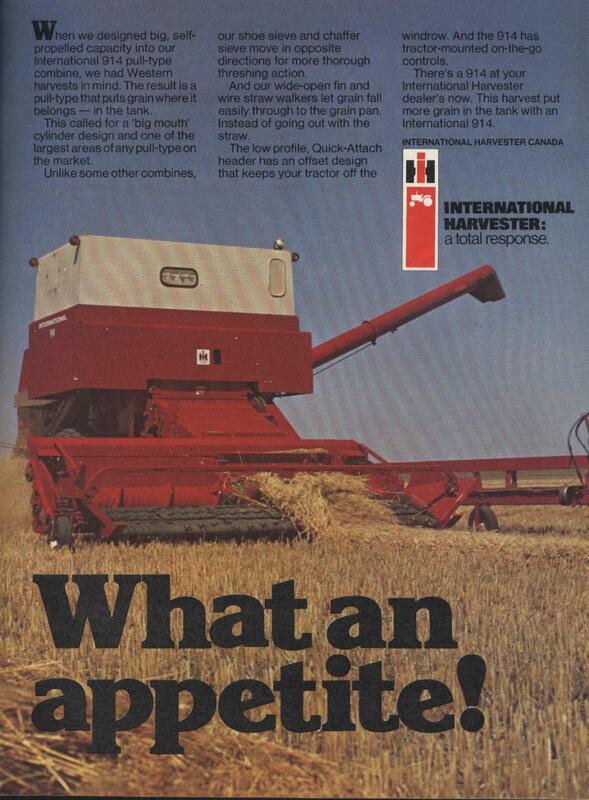 I do know that the very latest 914s had the red top grain tank. This one is obviously a white top. 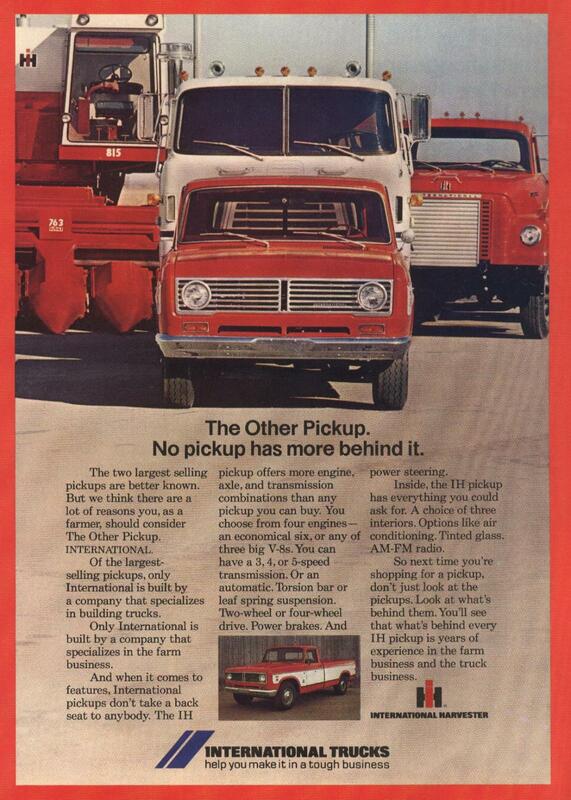 I believe the 914 was built a year of two after the 1400 series came out in '78. 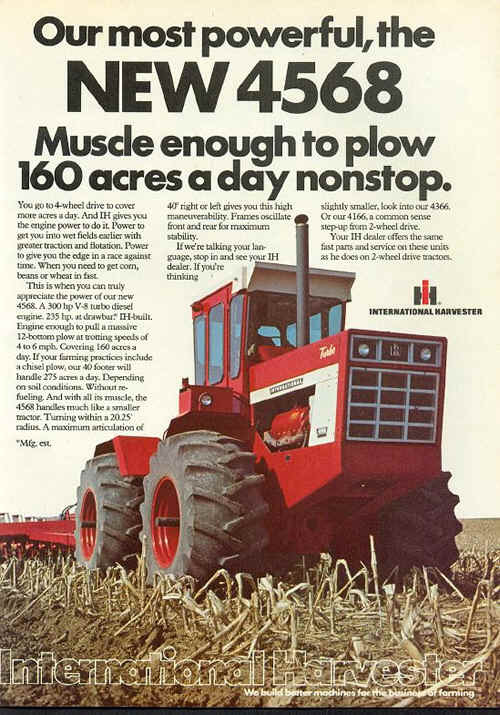 I don't think the 1482 pull type was available right away. 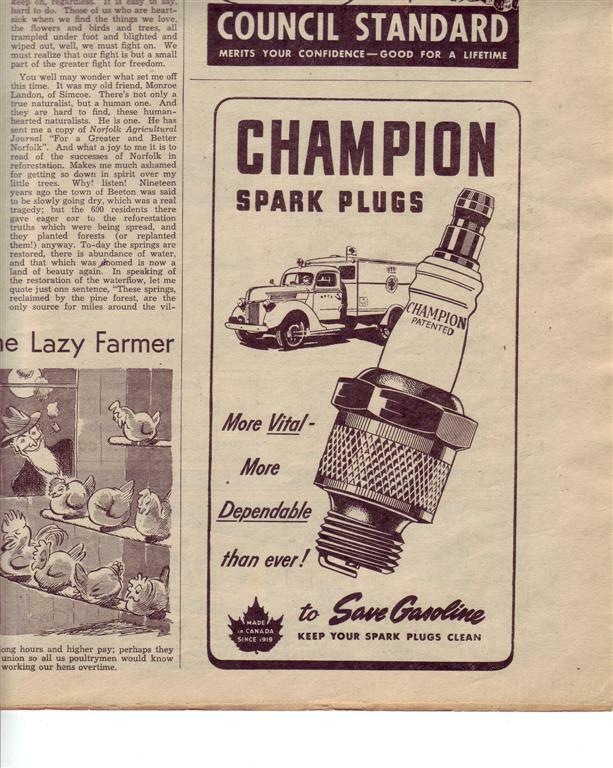 Here is a few from The Canadian Countryman dated April 18, 1942. 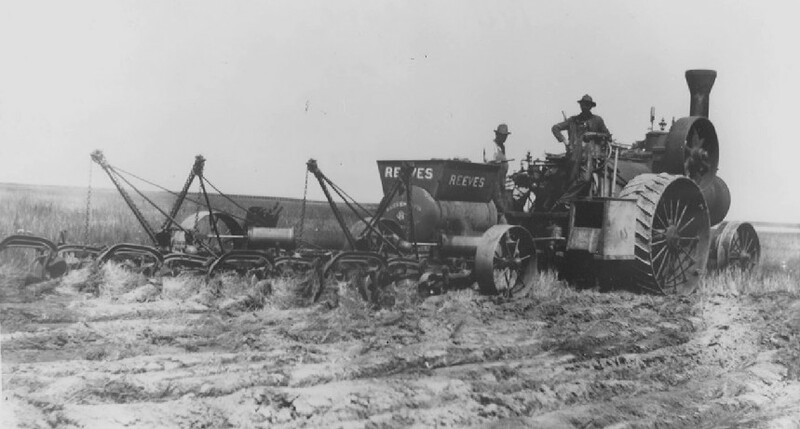 Another that is undated of Cockshutt combines. 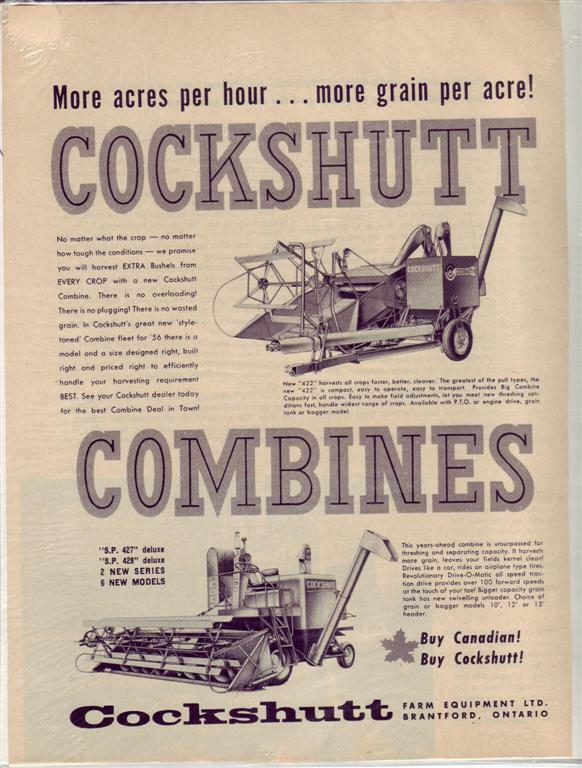 Another Cockshutt combine ad from Farmers Advocate and Canadian Countryman dated July 12, 1958. 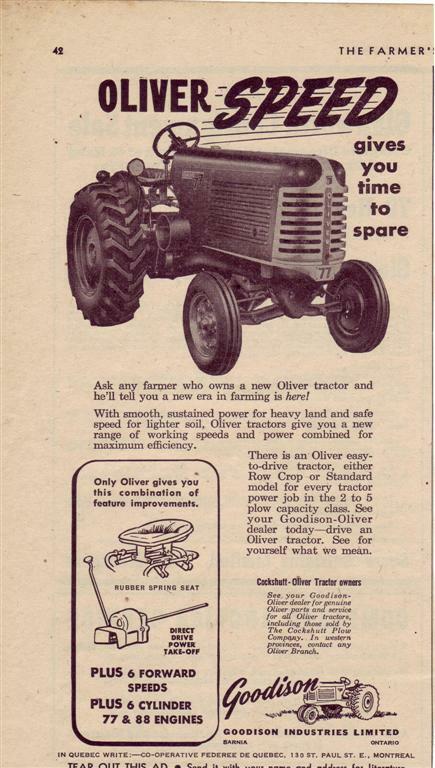 Also an undated Oliver ad. You guys will have to come to my shop to see mine. I have over a hundred IH ads from 1930's to 70's framed and hanging on the shop walls. 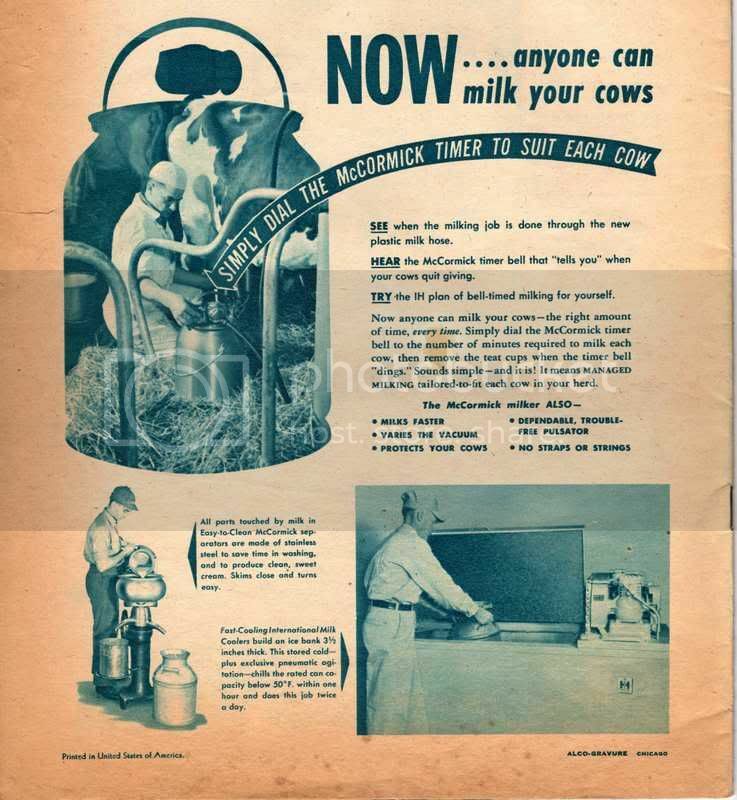 I am adding all the time. 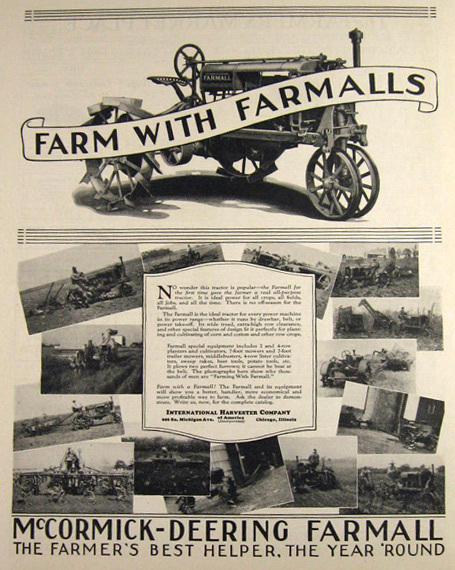 The 8 x 11, 10 x 13, and 11 x 14 ads I buy frames for, but the doubles or two page ads, I get glass cut and build frames from old barn wood. It doesn't photograph well because of the glare, but is a lot of fun to look at for inspiration.